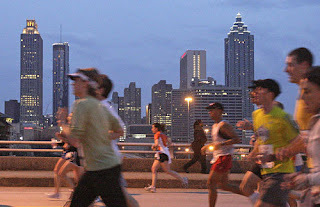 The night before a marathon or half marathon is one of the key times for me to prepare for what the next day will hold. Last night wasn't much different other than the fact that I put it off till the last minute. I didn't start any of the planning till after 9:00 pm which is when I needed to start winding it down to get some much needed sleep before the early morning wake up call. I did get everything ready and drifted off to sleep shortly after 10:00, but only after setting the alarm for 4:45 am. I needed to leave by 5:00 and I had everything ready so I could do a quick grab and go. This is kinda typical for me for the big races that require a really early departure time and it has always worked fine for me. I arrived downtown Atlanta shortly before 6:00 am and made my way past the sleeping homeless people along the buildings to the CNN parking deck. Traffic was good, and it didn't take me too long to make it to the parking lot and then to Olympic Park from there. I was a little lonely since this is one of the first races I have done completely by myself from the travel to the running. I tried finding some little blue boxes, aka dump and go or is it go and dump, or whatever else you want to call them. I had some trouble at first and started getting worried. I finally found a line and stood there for a few minutes before someone walking by mentioned a bunch of them just around the corner. A few of us headed that way and eventually found them at the back of a parking lot. They were hidden pretty well if you were coming from the park, however it turned out to be right in front of my H starting corral. While waiting for the race to start I noticed a guy wearing a Soldier Marathon shirt so I struck up a conversation with him. It turns out that he was from Columbus and knew the race director. We had a good conversation about the race before I saw one of me neighbors walking by. This neighbor is one that I seem to see at almost every race I run, but he runs much faster than I do so he was in a different corral. Before letting the other guy go I told him that my daughters were working the mile 18 water stop and told him to stop by and say hey when he got there. He was a red head like my daughters so I knew he would be able to find them. After my neighbor took off to head to his corral I went ahead and walked into mine. I struck up another conversation with a group of three guys that were there together and warned them if they didn't like to talk while running to avoid me through the race. I didn't know they would tell everybody else my secret as well because I couldn't find anybody to talk to the entire race, either because they were wearing headphones or were already talking to someone. 7:00 came and we started to move. I didn't realize how far back we were until we started walking, and walking, and walking. I am used to being near the front in the Peachtree Road Race and so I don't have to deal with all this walking before getting to the start line. When we finally made it to the start line and crossed it running I noticed the race clock was already ticking through the 8 minute spectrum. I was originally signed up for the marathon and I had signed up and started my training late for it. because of this I knew I wouldn't be running it fast so I was very cautious when I put an anticipated finish time. When I decided to drop to the half marathon this ended up being back much further than I should have been, even considering the current injury and trained level. This meant that I spent the first two miles weaving in and out of people trying to make up some ground. This even continued beyond that, but did get a little better. Throughout the entire race I don't recall many people passing me at all, but I do remember constantly working my way up in the pack until around the 9 - 10 mile area where it stayed pretty steady. This also reminded me of the Peachtree, but only worse once again because I start closer to the front in the Peachtree with others mostly running similar paces to me. For the first couple miles my thigh/groin was showing a little pain, but this has been the case off and on for the last few weeks and I was confident it would loosen up and I wouldn't feel it anymore. This time did come somewhere around two miles and for the majority of the race I didn't feel that pain. My leg never felt 100% but I didn't expect it to either. I enjoyed the course but it was a little more rolling than I was lead to believe it was. There was only one hill that really bothered me and that was later in the race. We ran through many places downtown that I have never been before so I was lost and really didn't know where I was most of the time. Every water stop had both water and Gatorade which is something I haven't seen often. They were all well staffed and stocked. I skipped a couple of them because of congestion, and chose to stay away from the GU for the entire race because of the shorter distance. At the 7 mile mark the half marathoners and marathoners split. I am sure people running were not worried about me, but I did see a lot of spectators eying my bib since it was a yellow marathon bib when everybody else's was green. They told me at the Expo that I could drop to the half marathon but I would not be given an official change so I would still be running with a marathon bib and would keep the marathon shirt. I am a little disappointed in that because I would rather have the shirt of the event I actually ran in. Mile 10 came and so did the overwhelming fatigue. I was all done with this race mentally at that point. I knew it was just a 5k left and I heard that said a bunch of times by both runners and those along the sidelines. It may only be a 5k, but I usually don't run a 5k after I have run either 10 miles or even 23.1 miles so I really don't know how that is an encouraging statement. When we run races the mental aspect and fear of hitting the wall are big players at all distances. If we are timid and let fear get in the way we will never reach our full potential. We need to treat fear as just one more competitor that is lining up beside us at the starting line. If we focus on beating fear and giving 100% every time everything else will fall into place. The last mile seemed to go on forever, and that may have been because volunteers and spectators started telling us we only had a mile left at the 11.5 mile area. I am not the most alert academically at this point but even I can figure out 11.5 + 1 doesn't = 13.1. This continued on when they were telling us only 1/2 mile to go at least 2 tenths of a mile before the sign actually said 1/2 mile to go. I am pretty sure I slowed a bit during that last mile because I had given everything I had and just simply wanted to quit. When I looked back at my splits it shows what I expected it to. I ran a couple solid miles before that final mile and then I slowed my pace by 30 seconds. The finish line came, but as the song says, not a moment too soon! I was happy to cross that finish line even though it was the slowest 1/2 marathon I had ever run. My final time was 1:56:13 by my watch and by the official results. This was slower than my first half marathon back in 2008 by 30 seconds, and 11.5 minutes slower than my current half marathon PR from a a year and a half ago. The only other 1/2 I have run was last October and I ran it somewhat injured as well, but much better trained and I ran it 4 minutes faster than today. I ran a better race than I was expecting and for that I am very happy. 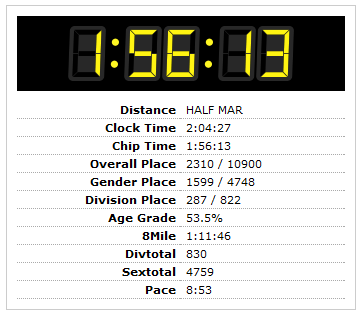 I did get a bit discouraged when I realized it was slowest half marathon though. I will get past that and as my wife told me - "It is only up from here!" When I crossed the finish line I joked that I needed the full marathon medal. I didn't realize they were actually supposed to give me the full marathon medal since that was the race I registered for. He then wouldn't give me the medal and sent me further down the chute. The next person that came to me gave me the half marathon medal without saying anything. I found out later this afternoon from someone else that they wouldn't give her the half marathon medal and made her take the full marathon medal. I wouldn't want a medal that I didn't earn and she was upset too. The finish line was well stocked and the volunteers were being very generous. I just held my bag they gave me open and they were throwing multiples of everything in there. I was wondering at that time how that was going to work by the end of the race and I found out on Facebook when I got home that it didn't work out. I don't think this was Publix fault necessarily for not having enough food, but rather an issue with the volunteers being well trained on what they should be giving out. I wasn't even asking for multiples, but they were giving it. After the race was a little depressing for me since I had nobody to meet me or even to talk to at the end. I walked around and quickly realized I should have taken one of the blankets at the finish. I was hot when I finished, but quickly started to get cold after my core temperature started to drop. I didn't see much I was interested in at the surrounding tents, and couldn't figure out what the food ticket on my bib was for so I got my cupcake and started the walk back to the car. It was a long walk because I had to walk way out of my way to get around the course that was still being run. All in all I think it was a great race and I would definitely run it again. 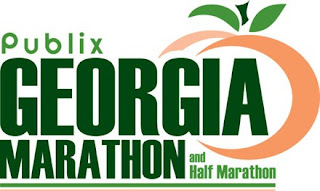 Hopefully next year I can be better trained and injury free so I can take on this half marathon again... or maybe even make another attempt at the full marathon at this race. I talked to my daughters when they got home and they mentioned that some red-headed guy stopped and told them that he met their dad and to tell them that he saw them. I had already forgotten. :) They enjoyed working the stop but said it was cold. If you ran this race tell me about it in the comments, if you have a race report written on your blog, Dailymile, or anywhere else please link to it in the comments as well. I would love to hear other peoples experiences at this same race. Good job Tim. Way to stick with it despite the injury issues you had in training. Hi there, Tim! I also ran this as a half (with my yellow marathon bib)! No one said anything, but I also got a few weird looks. I was almost an hour behind you--my slowest half-marathon--but I enjoyed the course and the people. I was one of the folks who arrived at the end to get a banana and nothing else. I saw all the tantalizing signs for chocolate milk, etc. But was out of luck. That was a little disappointing but I think your assessment was correct. They were even trying to shove 2 and 3 bananas at us. I suppose they wanted to fill up our bags. I liked the course, but it was very hilly! I very much enjoyed the crowd support and the water stop volunteers were terrific! I wish I had known to look for your daughters! Tell them thank you for volunteering! I will probably run this again next year but will train better and not run it so soon after my previous half-marathon! Congrats on the finish! injury and all that is a pretty darn good time :) I thought about your daughters as I passed through the Amanda Riley station. Glad they could participate. I agree - that last mile was the longest! After going through that last water station the course seemed to stretch on for days. I was glad they had signs towards the end that said "1/2 mile to go" and "1/4 mile to go". I ran the full and I think I got there after they attempted to restock the food. There was nothing to drink and I thought the food selection was a little odd but it didn't occur to me until later that they had probably run out since I was well after the half marathons had all finished. When I got there, they had cupcakes, M&Ms, bananas and crackers and nothing to drink. It sounds like they just needed to do a better job of training the volunteers on rationing out the post race food. Again, congrats on a great race! Congrats Tim! So glad the leg held out for you. Rest up now! great race results Tim! good work! I think this is probably one of your most impressive runs. Way to stick with it after the injury! 8:53 pace? Seriously great work Tim! The back half was extremely hilly - I did a 1:47 first 13.1 then a 2:17 the final 13.1. The hills at mile 19 and 25 were ridiculous. 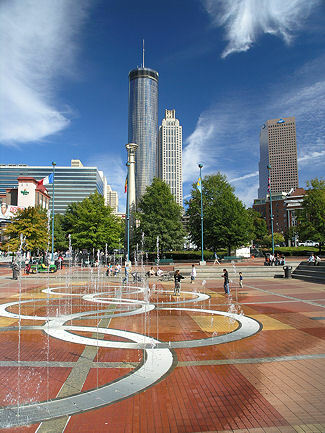 Fun event though, Atlanta is a great place. I know how you felt at the end. It was my very first half and I hadn't really met anyone in the racing community yet and told my husband to stay home with our young son -- too cold and crowded. I got done and felt so down. I'd expected to feel so happy, but that didn't happen. Luckily, that hasn't happened since then because now I have lots of racing friends thanks to the blogging community. Thanks Lori! It was much more rolling than I expected, but it is one I will do again! Thanks for the comment! That sounds very familiar to what another friend said he got at the end of the race. He ran a 3:39 marathon. I am with you, it is just a training issue, but one that cost them and a bunch of runners! I should have, but I have never had trouble finding anyone to talk to before.... it was strange. It may also have had something to do with not being 100% into this race as well so I may have been kinda keeping to myself without even realizing it. I have thought long and hard about this Andrew since I saw you post it. You may be right, it had the most challenges getting to race day, and even though it wasn't as hard as that first (or second) marathon, it was hard in many other ways. Thanks David! I have heard about that back half. When I get around to being able to run the full without injury I will need to come very prepared for those hills! Thanks Kerrie! It was poor planning on my part, but also because I am not used to these bigger races. Usually the races I run are a little smaller and more local so I know more people. It could have been a little bit of me too since I didn't want to answer the question about the full marathon bib again... I felt like people were thinking that I just gave up instead of making the choice earlier because of injury. than on the actual course. It was way too crowded. Bravo on your effort! Way to push through at the 10 mile mark. I can imagine your feelings at the end of the race. I don't have any friends running the marathon with me this weekend. With the fee comes a free lunch at the awards ceremony, but I passed it up because I don't know anyone personally. :( Ah well. At least we both can tuck another distance run under our belts, no! Yay for you!! Thank you for sharing your experience. Great job, Tim! Your race report reminded me of something I just read this morning: Blessed is the one who perseveres under trial because, having stood the test, that person will receive the crown of life that the Lord has promised to those who love him. " (James 1:12). You sure did persevere and that's what competition is all about. Way to go. I hope to run this one next year. Thanks Blanda, good luck in your upcoming marathon... or was it this past weekend? Good luck, and most of all - enjoy!! Great job! Great write up too. Much respect, really dig your blog.